In the first round, Branagh’s stage version knocked off the 1998 post-apocalyptic film by Michael Bogdanov and starring Sean Pertwee (with Bogdanov’s Lady M–Greta Scacchi–almost swinging the decision in their favor). Goold’s filmed version of his stage production made quick work of the over-done but under-good 1998 film. Branagh’s live capture fares better than that earlier film. 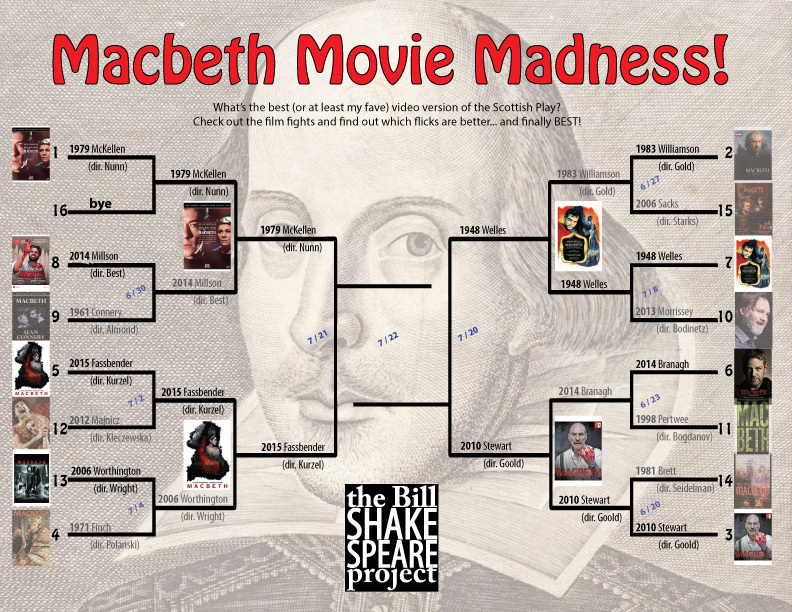 His Macbeth is a well-constructed piece of characterization, and beginning the play with a protracted battle sequence that allows for the skipping of much of Act One, Scene Two is a brilliant move. It’s a muscular and physical production. The only weakness for me is that Alex Kingston’s Lady M starts at too high an emotional state, leaving not a whole lot of room for growing intensity. Goold’s 2010 film doesn’t even have a weakness that obvious. It’s a killer version. Scary witches, both stagey, unreal, and yet believable. It’s an insane world, getting weirder with every death. If the Branagh version is muscular, Goold’s is sinewy, with Kate Fleetwood’s Lady M a perfect analog for that. And it wins extra points from me for what seems to me to be an homage at the very end to the underrated 1987 Alan Parker film Angel Heart–an elevator ride to hell (it may be completely coincidental and not intentional, but it still works). So if this was a boxing match between two heavyweights, then it’s “down goes Branagh, down goes Branagh” and Stewart moves on to take on Welles in his 1948 film in our first semi-final… later this week!